Flew 90 minutes from BA’s Jorge Newbery airport to Mendoza in a comfortable Embraer of Aerolineas Argentinas, the state-owned carrier. Their route map shows “Las Malvinas (Arg.)”. On arrival we took possession of a brand new rented Ford Eco Sport. Obliged to sign a statement that we would make a special contribution to repair costs “if we rolled it over”. Supposedly happens quite often. Drove south on route 40 past Luján de Cuyo and Chacras de Coria through scrubland, then turned west to Tupungato, climbing gently up to 1200m., 90 minutes from Mendoza. We are staying 2 nights at Posada Salentein [guesthouse of eponymous winery], which sits on a wooded crest amid their vineyards looking east down the Uco Valley. A good dinner accompanied of course by Salentein wines: Chardonnay, Sauvignon Blanc, Malbec 2013 and a sparkling wine of late harvested grapes. 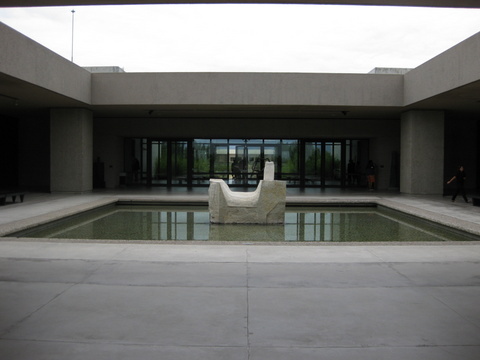 – Two huge low concrete buildings housing a) the winery itself most of which is below ground level and b) the central wine shop/restaurant/art collection at ground floor level. They are 200m apart. – A strange chapel, much smaller than the 2 main buildings but similarly low and made of concrete (relieved inside by ancient wooden pews, also gray). The chapel stands alone in an imaginary straight line connecting at 200 m intervals winery, central building and chapel. Young guide Mauricio gives us an informative tour of the winery. A massive steel, domed roof hovers over a central cylindrical space off which fermentation, maturation and tasting take place. At level -1 gleaming new steel fermentation tanks of several sizes occupy a vast hall which opens off the central space on 3 sides: tanks as far as the eye can see. They produce 18 million bottles p.a. which in Argentina, as we are told, is not a lot. 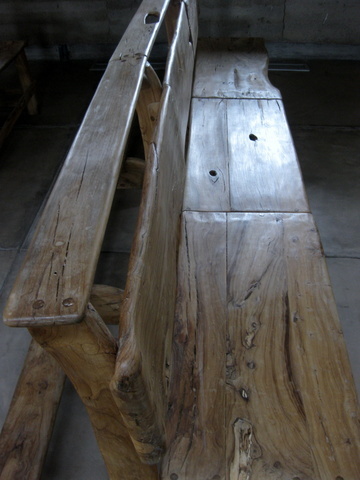 Roughly 2 million under the Salentein brand, the rest labelled as Portillo or bottom of the range Callia. Prices range from US $ 2 to 50. At level -2, the bottom as far as we know, the central circular floor space consists of 4 large arrows resembling a giant compass. Beyond the arrow points are several outer spaces: one is open and unfurnished, clearly for events, a piano with lid open waits to be played. I play a few chords, my fingers wet from the damp keys. I wonder how long a piano lasts at 80% humidity (it seems Steinways are happy around 50%). 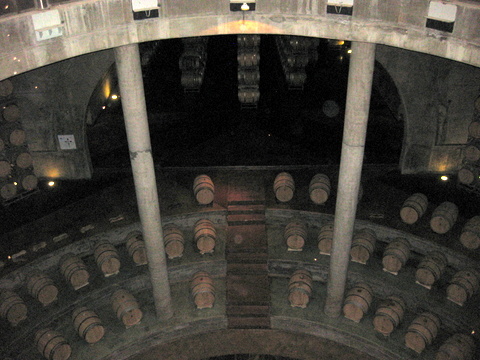 The other segments are occupied by barriques of maturing wines piled high and by at least 2 tasting rooms. These are reached through a high stone arch over which is engraved “Salentein MM” in large gold lettering. On another wall is the Salentein coat of arms which is the Group logo. Salentein, btw, is the name of the castle in southern Holland belonging to Mijnhardt Pon, the winery ‘ s creator and owner until his death last August. This was clearly a man who loved Argentina and saw a great future for its wines, a man of architectural vision and exceptional wealth, also a degree of religious mysticism. A quick web search shows that his grandfather was an early importer of cars into Holland, a business in which his heirs have been highly successful. In Holland they own fruit farms as well and a brother has a winery in California. 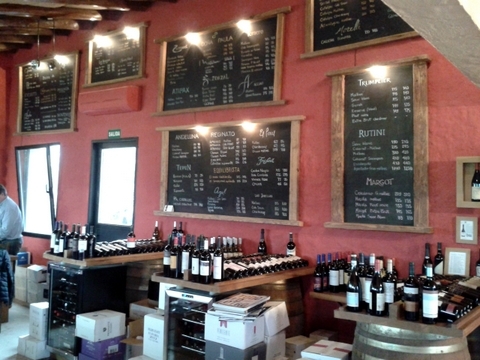 Our visit allowed us to taste 3 wines: a fresh Sauvignon Blanc, an unremarkable Cabernet Sauvignon and a good Malbec. 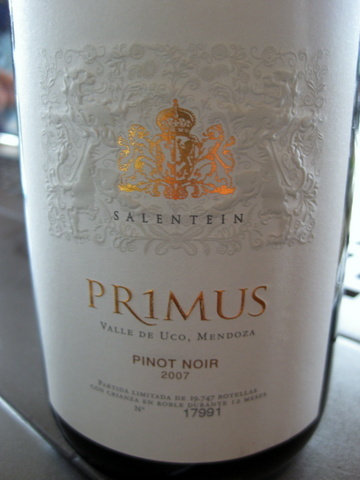 Their top of the range Primus Pinot Noir [below] of which we drank a bottle at lunch was quite unusually complex and satisfying without losing its p.n. typicity. 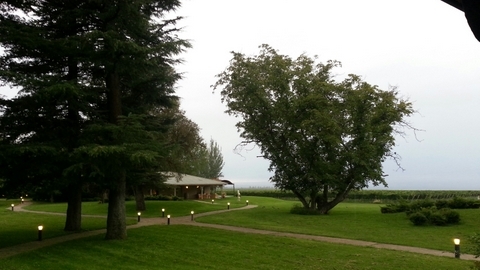 We stayed 2 nights at the Salentein Posada, a couple of kms from the winery complex. It consists of several bungalows, a pool and a restaurant building, all set in a spacious garden full of fine old plane trees, walnut, cedars and chattering birds. The buildings are cool, minimalist, as if unfinished, lacking colour, not places in which to enjoy a glass of wine with friends. Also in need of modernisation. Staff are very young, friendly and helpful but somehow distracted as if their real job was something else. 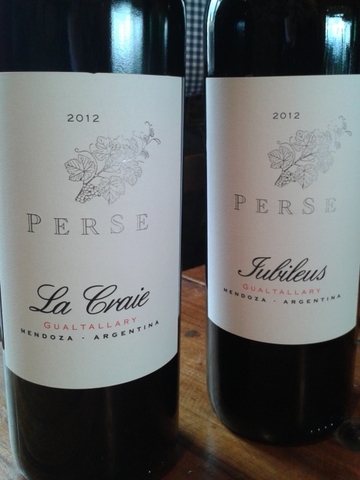 The day ended with a vineyard visit and tasting with the charming Edgardo del Popolo of Per Se Wines. 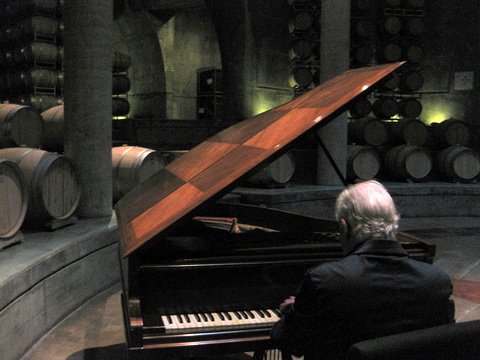 He seems to have travelled the world of wine and worked for several local winemakers [Doña Paula, Susana Balbo et al]. He is passionate about soil and about his bush vines. Showed us a metre-deep hole in which you can see the downward sequence of soil, gravel and larger rounded stones – a living geology lesson. Vine roots are visible searching for nutrients below. 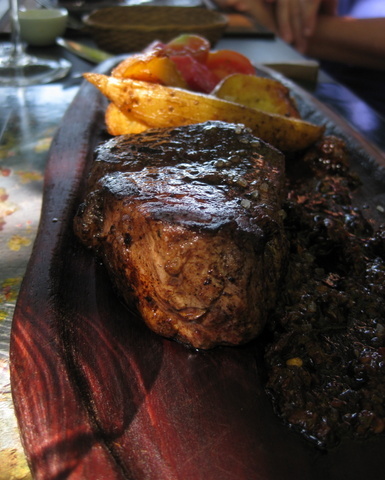 Eddie took us to nearby resto-hotel Tupungato Divino to taste his wines. TD is immediately appealing: all the warmth, colour and background jazz that is missing at Salentein. Wine bar, shop, restaurant and small hotel. Ideal place to stay next time! 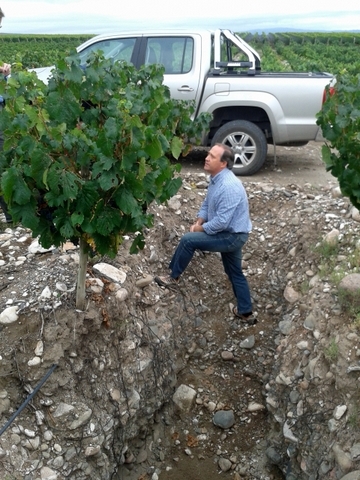 Picked up by Juan Argerich at the Salentein Posada, who drove us to 2 quite different vineyards in which he is involved. First at La Consulta, we had the chance to taste the Malbec grapes: small juicy berries with hard pips (“don’t chew them, full of raw tannins, bitter”) but skin already producing red colouring, harvest in 3 weeks. Juan explained the importance of irrigation and how they hold the snowmelt water in basins, perhaps filtering out excess calcium or whatever. We saw the anti-hail netting either vertical protection or stretched between rows or roofing above the vines. Never seen any such protection in Europe. Second, we visited newish vines planted on recently cleared scrub right at the foot of the Andes Chain at Gualtallary, some 100 hectares. 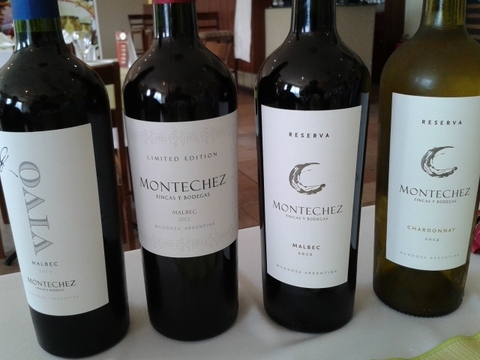 Juan manages the vineyards for a number of farmer-investors, makes wine under the Montechez label [a selection, left] from the best grapes and sells the rest. To plant you must own water rights. If water is not available you drill, hoping to find it. In this case they drilled down two or three hundred metres and didn’t. Had to lay a pipe from a valley source and pump it several kms up to the top of the vineyard via 2 pumping stations. At the end of the day we drove an hour towards Mendoza to a beautiful family-run hotel Lares de Chacras. Quiet leafy setting with pool and garden. Here for 3 nights. 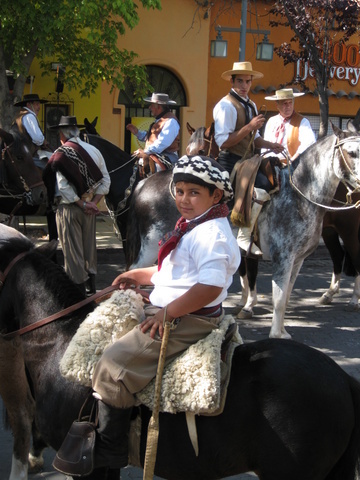 Early wander around Chacras de Coria, bumped into a gaucho fair in the town square. Most of the day relaxing round the pool. Went out to dinner at 1884 Francis Mallmann [chef featured on British TV recently on A Cook Abroad, when John Torode visited him at his other restaurant, Siete Fuegos]: big reputation, big disappointment. Spent a couple of hours wandering around Mendoza, not much to report except for its giant plane trees lining every street often up to rooftop level. From Mendoza we had our first clear view of snow-capped Aconcagua nearly 7000 m above sea level, the highest in S. America, and of Tupungato, flat-topped and snow-covered, a bit lower and south of Aconcagua. 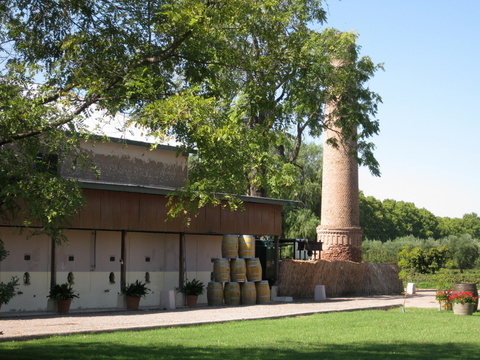 Visited Lagarde winery in Luján de Cuyo, near hotel and Mendoza. Received by the immaculate Sofia Pescarmona [below] and her winemaker, Juan Roby. 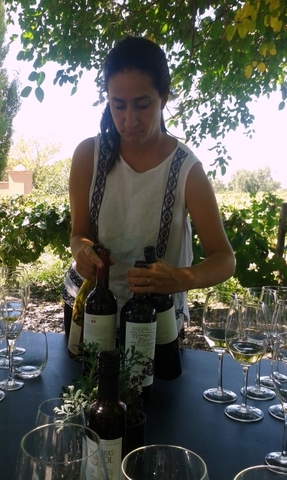 Sofia, now 40, grew up with the daughter of our Martindale hosts and is leading one of Argentina’s oldest, still family-owned wineries, along with her sister who handles sales. Both parents are still active in the business but S. seems firmly in the saddle. One of our most delightful tastings so far: several wines combined with an elegant lunch (pleasingly small portions) sitting under shade-giving trees surrounded by other happy tasters. Manet painted just such a scene, I’m sure. Two whites including a superb Chardonnay, a fine sparkler (and a second one with dessert), an outstanding delicate rosé (unusual for Argentina), 2 or 3 Malbecs, the last of which retails at US $ 50-60 and is worth it. She has great plans for Lagarde which include a new purpose-built restaurant and zero net energy buildings. Their house philosophy: “honouring the past, imagining the future”.